Sunshine is a high-stakes crime drama that explores the hopes and heartbreak felt by those forging a new life in a foreign land. It is vibrant, kinetic and compelling. Set in Melbourne’s outer-western suburb of Sunshine, the story follows Jacob Garang played by new on-screen talent Wally Elnour. Jacob is a young, aspiring South Sudanese-Australian basketball player whose dreams of climbing his Biblical namesake’s ladder to heaven – the American National Basketball Association – hang in the balance when he’s drawn into a criminal investigation. Police are hunting down the perpetrator of a violent assault, which has left a young teenage girl in a coma fighting for her life, and a group of young men fighting for their innocence. 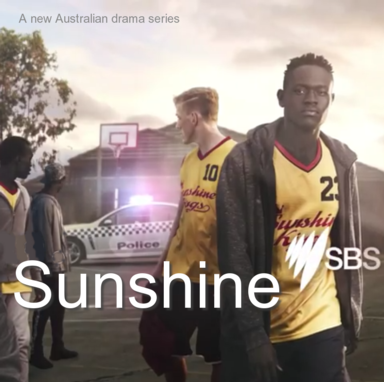 Sunshine is a powerful, bold, and uniquely SBS drama that speaks right to the heart of the SBS Charter – exploring themes of identity and belonging, class and race inequality and the nature and construction of truth. Anthony LaPaglia and Melanie Lynskey deliver outstanding performances alongside some fresh and exciting new faces, including a stellar South Sudanese Australian cast being seen for the very first time on Australian TV. The edge-of-your-seat drama features an exceptional line-up of renowned and seasoned Aussie actors including Kim Gyngell (Rake, Jack Irish), Tiarnie Coupland (Love Child), Vince Colosimo (Jack Irish, Janet King, Underbelly), Leah Vandenberg (The Wrong Girl), Paul Ireland (Jack Irish, Underbelly) and Trudy Hellier (Winners and Losers, The Doctor Blake Mysteries). Ror da Poet, Autiak Aweteek and Nick Perry shine in their television debut. Sunshine is directed by Daina Reid (The Secret River, Never Tear Us Apart: The INXS Story, Paper Giants), executive produced by SBS’s Sue Masters, produced by Easy Tiger’s Ian Collie (The Principal, Rake) and Carver Film’s Anna McLeish and Sarah Shaw (Snowtown, Partisan), and written by Matt Cameron (Jack Irish, Secret City) and Elise McCredie (Nowhere Boys). Broadcast premier dates: Wednesday 18 October at 8.30pm continuing Thursday 19 October, Wednesday 25 October and Thursday 26 October at 8.30pm on SBS. Episodes will be available after broadcast anytime, anywhere, for free via SBS On Demand.